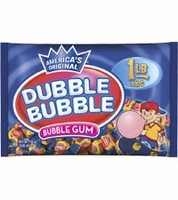 The Original Double Bubble flavored bubble gum, none of that watermelon or kiwi flavored kids stuff. This nostalgic bubble gum is sure to bring back the days of standing in front of the dime store having bubble blowing contests enjoy. Get a one pound bag of soft and chewy individually wrapped pieces of bubblegum that is no fat, low in carbs and still satisfies your sweet tooth. Some bubblegum facts: In 1928, an employee of the Frank H. Fleer Company, Walter Diemer invented the successful pink colored Double Bubble, bubble gum. The very first bubble gum was invented by Frank Henry Fleer in 1906. He called it Blibber-Blubber. Fleer's recipe was later perfected by Walter Diemer, who called his product Double Bubble. Have you ever wondered how bubble gum was invented ? How it got it's name ? Why is it pink ? At last all your questions can be answered .We found this video and found it very interesting and thought you might enjoy watching it too.